An intriguing adventure concept, well in line with the Forgotten Realms tradition of high fantasy. Publisher's blurb: "The city of Manifest rests atop ruins from ancient times and far above the entrance to the land of the dead. Here, the world of the living is shared equally with the deceased, who linger in physical form before finally passing through the Veil. Whether currently living or dead, residents and visitors are assured of an eternity of action and intrigue. 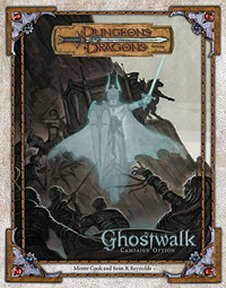 "Ghostwalk contains everything needed to run a stand-alone campaign in and around the city of Manifest, or to integrate it into an existing world, including rules for playing ghost characters and advancing in the new eidolon and eidoloncer classes, several new prestige classes, over 70 new feats and 65 new spells, three complete adventures, four highly detailed encounter sites, and fourteen new monsters and templates."